Get four in a row using your favorite color by Krylon®! For maximum adhesion, sand the wooden Connect Four base, along with the circular pieces using medium grit sandpaper. Place a drop cloth in a well-ventilated area, away from dust and debris, to prepare for spray painting. Tape off any pieces on the base that should not be sprayed, such as metal hinges. 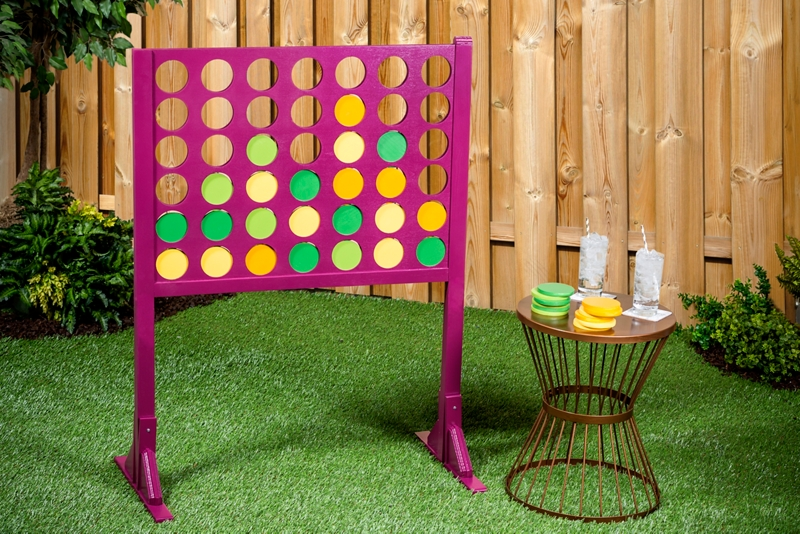 After reading the product label for proper application and safety instructions, spray paint the game board using Krylon® Outdoor Décor in Satin Dahlia. Allow time to dry. Next, divide the circular disks in half and paint each half a different color to create two teams. For a bolder look, use two different shades of the same color per each team! Apply Krylon® Outdoor Décor in Satin Wild Grass, Satin Shamrock, Satin Sunflower, and Satin Warm Sun to circular disks. Allow pieces to dry completely prior to applying paint to the opposite side. Once the paint has fully dried, carefully remove painters tape from the base and enjoy!